A series of essays on living a bad-karma-minimizing life. One of those annoying new acronyms, seen in text messages and on automobile bumpers, is YOLO. This stands for "You Only Live Once"; and is used to justify all kinds of reckless and inconsiderate behavior. And is it even true? Would it surprise you to know that early versions of the Bible included many quotes by Jesus supporting reincarnation, or that the early Church members, such as the great teacher and saint Origen believed in it? Well, all that's true. So, consider…if reincarnation were a fact, along with its corollary karma, would that have a significant impact on your attitudes concerning grief, death, or victimhood? Consider that you may owe it to yourself to at least look at some of that evidence. Lots of people use the term &apos;reincarnation&apos;, but few really know what it means. Find out here. Reincarnation is the concept that souls are continuously reborn in different bodies at different times and places. Many belief systems around the world embrace reincarnation, including Hinduism, Buddhism, Sikhism, Jainism, and a variety of New Age religions. 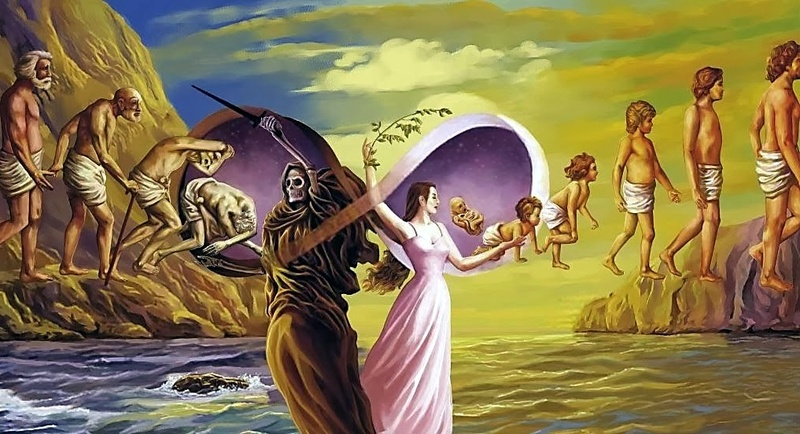 Each religion professes different beliefs about the cause and purpose of reincarnation, but some facts remain consistent. In most every case, reincarnation is a natural and very important part of the development of a soul; it is the process of struggling against some negative force, such as desire or karma, toward a higher state of being; and it applies to all human beings, if not all living creatures. Let&apos;s consider the ramifications of a belief in reincarnation. Why was reincarnation banned? Simple. Under the concept of reincarnation God does not punish anyone. We are the ones who are responsible for the choices we make. We are also the ones who will decide how any of our negative actions (karma) will be balanced with love during a future life. This belief system does not require a formal church with doctrines, dogmas and donations. In essence, if someone believes in reincarnation that individual does not need anyone to serve as an intermediary between himself or herself and our Source. God is within, and accessible to, everyone! Of all the religions in the world, only one has actual evidence to back it up. Beginning in the 1940s, interest in the subject of reincarnation increased in the Western world; sparked, in large part perhaps, by the psychic Edgar Cayce. When further study revealed at least some scientific basis for believing in reincarnation, it became clear to anyone exposed to the information that here was, indeed, revealed a mechanism by which the Universe works. Once one accepts the concept of reincarnation, one finds it impacts every aspect of one&apos;s life. The only reason that reincarnation ever received blame for poverty and disease was the fact that some believers in reincarnation also believe that punishment from past misdeeds is the reason for all misfortune in this life. Rather than become caught in a pattern of cause-and-effect (called karma in Sanskrit), these believers refuse to become involved in any other person&apos;s problems. The traditional belief also sees people as victims, though of their own karma. The karma is in the past; the punishment is in the present and can&apos;t be avoided. That implies a certain degree of fatalism, and still doesn&apos;t leave much room for upliftment in any particular lifetime. How an understanding of reincarnation can dispell fear of death. But over the last few centuries, our leaders—the kings, the popes, even celebrities—have perverted the rules of the game to include the deaths of non-participants, and the drafting of unwilling or non-understanding participants. They&apos;ve also effectively raised the stakes by influencing our culture to believe that there is just one life per person (in spite of actual evidence to the contrary). And they&apos;ve created a mythic "afterlife" with a "heaven and hell", designed in such a way that most people aren&apos;t really certain they will make it into heaven. (This is done by creating a "moral code" no one can follow.) End result: An artificially-induced fear of death, which makes the rest of the Earthly experience stressful and basically no fun. But it&apos;s all a lie. To understand life to this depth does require a degree of spiritual enlightenment, I think. It&apos;s hard for me to picture an atheist who could put death into this perspective, which may be why my atheist friends include the most compassionate people I know. For them, death is always a tragedy, the end of a story with no postscript. There&apos;s a question that&apos;s been running through my mind for some time. A number of news articles have come along—a girl who died, untreated, for diabetic acidosis because her parents believed Jesus would heal her; the child brides of the Fundamentalist Church of Jesus Christ of Latter Day Saints; and more—suggesting that parents don&apos;t always know what&apos;s best for their children. But who&apos;s to say they don&apos;t? Does the government know better than the parents? Does the minister? Who owns our children?